For other uses, see Embankment (disambiguation). 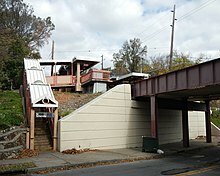 Cream-colored concrete abutment marks a gap in an embankment and gives vertical support to the dark red rail bridge, and to the fill of the bridge approach embankment. To reduce the metal cost of the bridge here it is further supported by erecting metal piers. A road, railway line or canal is normally raised onto an embankment made of compacted soil (typically clay or rock-based) to avoid a change in level required by the terrain, the alternatives being either to have an unacceptable change in level or detour to follow a contour. A cutting is used for the same purpose where the land is originally higher than required. 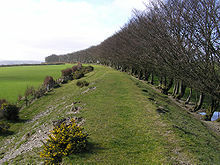 Embankments are often constructed using material obtained from a cutting. Embankments need to be constructed using non-aerated and waterproofed, compacted (or entirely non-porous) material to provide adequate support to the formation and a long-term level surface with stability. To intersect an embankment without a high flyover, a series of tunnels can consist of a section of high tensile strength viaduct (typically built of brick and/or metal) or pair of facing abutments for a bridge. Scott, J., Loveridge, F., & O'Brien, A. S. (2007). of climate and vegetation on railway embankments[permanent dead link].